Nope, the above quote isn't from Richard Dawson on Family Feud, but similar to a headline that caught my attention on the front page of the business section of the San Jose Mercury News this morning. Not that it was surprising, but that it would be news worthy of this placement. Once I got past the headline, I realized, that Scott Harris had the same reaction to the survey that I did. think nobody pays attention to DCF. I decided to go grab the survey to see if there was more. I pulled the report and buried in table 28 on page 35 is the data cited in the article. The data makes a lot more sense if you look at the entire table. I'd break down into two separate pieces - financial analysis and business/market analysis. 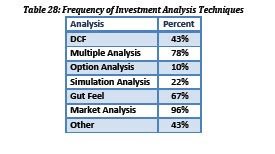 On the financial analysis end, you have multiples far and away the most common valuation method over DCF, Simulation and Option analysis. I've never heard of a VC running Monte Carlo simulations on possible outcomes. Either the company is going to be successful, wildly successful or will fail....I always focus on the business model and assumptions, but there are too many unknowns to put much faith in the future cash flow projections. On the other side, you have Market Analysis (96%) followed by gut (67%). This brings up the age old question on whether you are investing in markets or teams. If you've got a large growing market, solid team, strong competitive position and compelling solution, you'll move forward with diligence, which can range from going with your gut to doing detailed projections, numerous reference calls and deep market analysis. Let's get back to the topic of gut investing. I was a limited partner in Angel Investors, LP, Ron Conway's fund in the late 1990's. They clearly went on gut and were often accused of drive-by investing, but that has to be the only way to invest in 200 companies over a 3-year period. Luckily, Ron's gut told him to get as much money as he could in to Google, which saved the fund. I just finished reading Malcolm Gladwell's Blink. Blink starts with the anecdote of the Getty Museum's $10 million acquisition of a rare Greek statue dating from the 6th century BC. They spent 14 months researching the authenticity. A geologist spent two days examining the statue with a high-resolution stereomicroscope and removed a sample and "analyzed it using an electron microscope, electron microprobe, mass spectometry, X-ray diffraction, and X-ray fluorescence." The conclusion was that it was indeed old. However, when several experts in Greek sculpture viewed the sculpture, they were all able to see immediately that that it didn't seem right, but couldn't necessarily articulate why. Turns out they were right and the statue was fake. Whether this was gut, natural intuition, or some other subconscious analysis from years in the field, it doesn't matter. The point is their opinions weren't clouded by any vested interest or lengthy analysis. Certainly, a corollary to VC's who have seen hundreds or thousands of start-ups and can often tell within the first 2 minutes or 2 seconds whether an investment is even a possibility. Back to the survey. 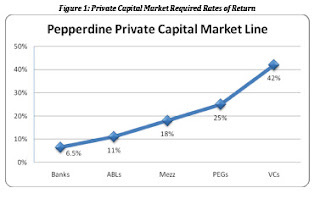 One other chart worth noting is the the expected returns from various private capital providers (Banks, Asset based lenders, Mezzanine, Private Equity and VC). From the chart to the left, you can see that the 42% expected return of VC is clearly an outlier on the graph. Of course, if you look at the Cambridge Associates data ( graph at the bottom left) comparing venture capital returns of top quartile vs. median funds, you'll see that over the past three decades, the median fund has never returned over 40% and that the returns have been 0% over the past ten years. In looking at that data, if I'm a VC and promising LP's a 42% return, my "gut" might be telling me to to find another job when the fund is done.